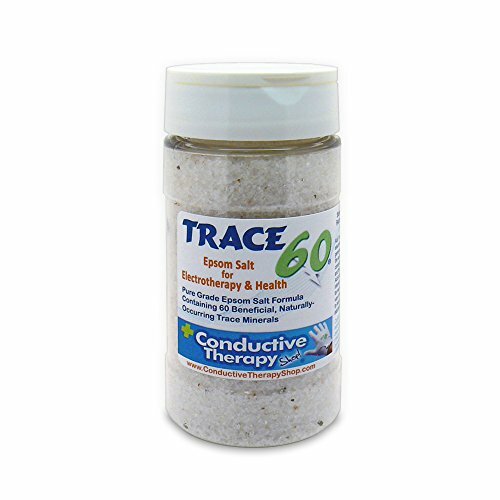 Conductive Therapy Shop's Trace 60 Epsom Salt combines the powerful health benefits of premium US Pharmacopeia Grade Epsom Salts (Magnesium Sulfate) with more than 60 naturally-occurring trace minerals beneficial to the human body. Clinical studies demonstrate that Epsom Salt improves nerve and muscle health, reduces inflammation, relieves pain, flushes toxins, enhances oxygen uptake, prevents artery hardening, and eases stress while improving circulation, absorption of nutrients, sleep and concentration. When used in electrotherapy bath protocols, Trace 60 Epsom Salt gives every treatment an exceptional conductivity boost while improving the ability of peripheral nerves to exchange healthy electrical signals, thereby enhancing the pain-relieving effects of the therapy. Proven, Powerful, invigorating and therapeutic, Trace 60 Epsom Salt can also be used for relaxing soaks, relieving tired feet and fatigue, in salt scrubs, facials, body wraps, amongst many other therapies. •	Premium USP (United States Pharmacopeia) Grade Epsom Salt blended with over 60 naturally-occurring, beneficial trace minerals. •	Ideal for TENS, EMS and other Electrotherapy Bath Treatments with submersed electrodes. Clinical studies demonstrate that Epsom Salt improves nerve and muscle health, reduces inflammation, relieves pain, flushes toxins, enhances oxygen uptake, increases absorption of nutrients, makes insulin more effective, prevents artery hardening, assists in the formation of joint proteins and brain tissue, regulates the bodies enzymes, and eases stress while improving circulation, absorption of nutrients, sleep and concentration. Unscented. Will not irritate skin. •	Comes in 8OZ and 16 OZ sizes in jar with snap-open shaker and spoon cap for easy application. If you have any questions about this product by Conductive Therapy Shop, contact us by completing and submitting the form below. If you are looking for a specif part number, please include it with your message.